The Security First Mobile app attracts and converts a new generation of insurance customers who expect a premiere mobile experience. The app provides a true omni-channel digital experience and offers valuable services for prospective and existing customers alike. 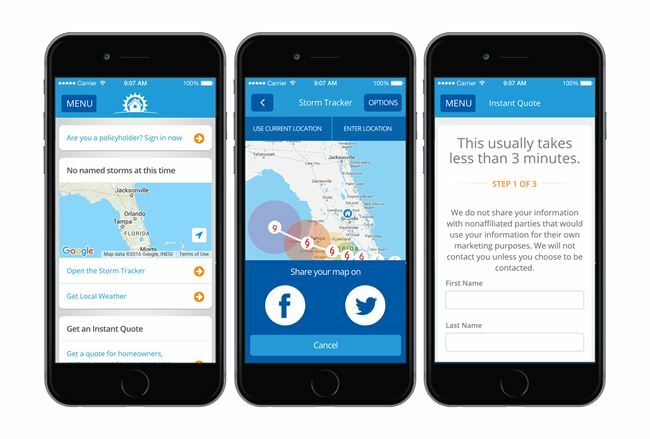 Floridians can quickly plot their address against an active storm’s projected path using the interactive Storm Tracker feature. Using social plug-ins, users can also share their map with friends and family. Additional Storm Center features assist users when storms approach and allow them to view evacuation routes and active shelter locations. App users can also calculate potential savings in under 3-minutes using the Instant Quote tool, and existing customers can log in to easily make payments, file a claim and manage their policy.